Download this Flipbook to see how HP MPS creates greater visibility into your usage patterns, reduces the need for IT support and helps ensure printing and imaging devices are being used effectively. Printing and document management play a significant role in any IT infrastructure. HP Managed Print Services offers a results-oriented approach in delivering cost savings and a quicker and easier response to change in your business. The number one goal in any IT environment is to improve business process workflows for greater efficiency to save you time and money. 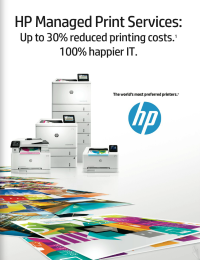 HP Managed Print Services helps control printing costs by up to 30 per cent and improves productivity.